Immersive Live Roulette is an incredible game released by Evolution Gaming. It is available on all tablet, smartphone and desktop devices. Taking into the account the superb range of the bet limits, this game is able to easily accommodate the most types of the casino game players. It also features the cinematic gaming experience under which intuitive interface automatically switch between the different camera views in order to increase up to the anticipation and the overall atmosphere. Thus, Immersive Live Roulette will quickly turn out to be your favourite title. How to play this fabulous Immersive Live Roulette? Whenever ‘Place Your Bets’ – sign is active, the table layout will proceed forward and thus, allowing the players to choose between 6 chip sizes which range from £1 up to £2,000. They can place their wager by simply pressing on a number or the area they wish to cover. And, once ‘Bets Closed’- sign occurs, then the table layout will return to its original position. Now, the players will not be able to place bets on that specific spin. While the betting limit ranges from £1 up to £10,000, this Immersive Live Roulette game can even accommodate the Special and Neighbour bets. It also gives the gamers a nice opportunity to save up their favourite bets as well as repeat them simply at any time. Also, the wheel in this game contains an alignment of the alternating black and red coloured spaces. Thus, the players will wager on the rectangular grid featuring numbers one through thirty-six along with the betting area for 0 space. A neat innovation which pops up the roulette table for twenty-five seconds “betting time window” is given. The whole game takes about 65 seconds. It shows statistics of last 500 spins of the Roulette wheel. It allows to chat directly with the dealer and even hides out the other player’s chat. It has a setting that allows the players to alter their video streaming quality. It provides a Help menu that provides the details upon how to play as well as in-depth explanations regarding the playing settings. It helps in placing the bets with the ‘Racetrack’. It also allows viewing the full history of the bets. It includes an option to choose the full-screen mode and even an option to switch off/on slow motion replays. 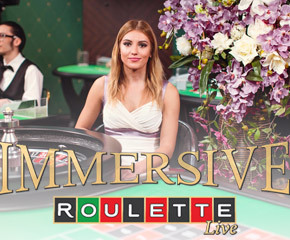 Immersive Live Roulette proves to be an amazing release for the live gaming industry. However, the rules and bets are similar to the original variant, but the players will like the enticing gaming experience given by Evolution Gaming.